The reversible and durable, flat, true braid fabric consists of 65% virgin wool and 35% nylon and contains no filler. The crafting of this rug requires manual skill and precision to ensure accurate color design, quality braiding, and stitching. Every Beacon Hill rug is guaranteed to be commercial-color matched and sewed with the highest quality spun polyester thread for maximum strength. 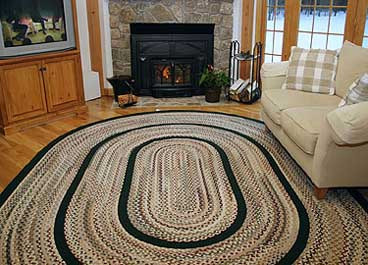 Minuteman and Beacon Hill, companion rugs, are the finest braided rugs made, by a manufacturing process that closely replicates the quality and construction of braided rugs made by our early American settlers.